Coldwater Creek Women's Size 16 Brown Capri Pants. Condition is Pre-owned. Shipped with USPS Priority Mail. Top button is loose, see pictures. Measurements: Inseam - 21" Length - 31" Zipper/Buttons Length - 5.5"
Black gingham plaid. 1950s style tapered/cigarette pants. The 40s and 50s are my favorite eras although I can often find things to like from any period. Elastic in waist and side zip. No stretch cotton. Coldwater Creek Pull On Twill Pant Straight Leg Classic Waist Size 2X 20-22. Condition is New with tags. Shipped with USPS Priority Mail. 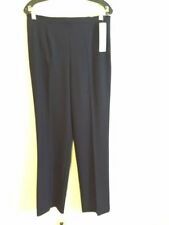 Coldwater Creek Ankle Pants - Size 12 - Cotton blend ankle pants with stretch. Front and back pockets. Front tab and button closure. Color is a shade of blue. 8 1/2" Hemline width. 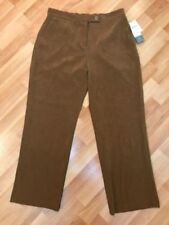 Coldwater Creek Womens Brown Pants Size 16 . The inseam is 28" and waist is 37". Condition is Pre-owned. Free shipping. They are from a smoke free home. They are in great shape. They are hole free, stain free and fade free. They are a dark olive green tone in color. My lighting was off when I took my pictures and make them look faded and off their color and they aren't at all. They have 2 button enclosed front pockets, 1 cargo pocket and 2 button enclosed back pockets, with front zipper and buttons. Bottom legs have a drawstring. NEW COLDWATER CREEK BLACK, SLIP ON TRAVEL KNIT PANTS. STRETCH WAIST BAND. STRAIGHT LEG. FLAT CROSS BOTTOM PANT LEG 9 1/4". INSEAM 30.5". In Excellent condition.no waist band. Invisible side zipper. Very slimming look. worn twice. and gained weight. Feel luscious on. Inseam : 28”. Rise : 12. EUC COLDWATER CREEK BLACK NATURAL FIT STRETCH PANTS SIZE 14. Condition is Pre-owned. Shipped with USPS Priority Mail. Please review all pictures for details. Size: petite 16. Material: linen. Details: cargo pockets, button and zip waist, back pockets. coldwater creek womenssize 14 cotton capri pants. Condition is Pre-owned. Shipped with USPS Priority Mail. Front Rise, Crotch to Top of Waist: 12". Inseam, Crotch to Leg Opening: 27.5". Leg Opening: 9". Great pair of linen blend lined pants by Coldwater Creek. Size L. Laying the flat the waist measurement is 17 in with a 31" inseam. Pull on elastic back waist line. Wide Legs. Good condition. Thanks for shopping! Fabric: 45% rayon, 55% linen, machine wash. Sorry I didn't iron them before taking pictures. The fabric is really soft, you will love them. Waist: 17" laying flat. This a beautiful pair of dress, straight leg dress pants that I would still be wearing if I had not changed sizes. They are dark brown in color and very comfortable with fabric that is soft and a slight stretch quality. Coldwater Creek Woman's Cotton Stretch Cropped Pants. • Cropped, Capri Length. • The Perfect Amount of Spandex for a Comfortable, Flattering Fit; 98% Cotton 2% Spandex. • Front Fly Zip and Button Closure. Tan Floral Print on Black Background. Leg Opening: 10". 96% Acetate, 4% Spandex. Front Rise: 11.5". Inseam: 23". Coldwater creek. These Feel like lounge pants but they look like dressy slacks. Full length pants. One pair has hem loose in front and fringes tears on bottom of one leg, the other has a small tear i included pics of all issues. Coldwater Creek Natural Fit, Size 16, dark tan stretch cotton pants, excellent to like new. Fabric: 98% cotton 2% Spandex. On rare occasions a small detail may be missed. Waist flat across 18". Length 42". Great office career casual pants. outer seam 41. Lightweight loose fit pants with elastic waist and drawstring. Waist 36" (elastic makes in larger). Stylish Navy Blue Piping on the outside seam (see photos). 97% Polyester 3% Spandex. Black Coldwater Creek Cropped Capri Pants Size 16. Waist 18" when laying flat and stretches to 19.5". Rise 11.5". Nice pair of stretch-acetate travel-knit straight-leg pants from Coldwater Creek has 1-in. elastic waistband and straight legs. Size large. Made in USA. Leg opening at hem: 18 in. 95% acetate, 5% spandex. Wash Stonewashed. Coldwater Creek Dark. Blue Floral Crop Pants. Waist side to side laying flat 15". Coldwater Creek Women's White Cargo Capris. Size: 12. I have listed the size on the label, I don't make any assumptions regarding the item running small or large. Inseam: 21". No issues that I can see. Beach ready roll up and snap capris with large pockets in a loose fit. Lightweight, soft and sturdy tencel and linen blend. 60% Lyosel (Tencel) 40% Linen. Coldwater Creek Cargo Capris. Machine Cold Gentle/Low Dry. Cropped Pants / Capris. Coldwater Creek. Waist Side to Side: 17" Hip to Hip: 19" Inseam: 17.5". I make every effort to disclose any tears, stains, missing beads or buttons, ect. Due to lighting and computer monitor settings there may be variations in color of the item pictured. Two hip and 2 back pockets. I will get back to you ASAP. Color(s): gray. Length/Inseam:41" /28”. Condition: Excellent condition. Natural Fit CottonLuxe Slim ankle Pant. Coldwater Creek Natural Fit black casual pants. Inseam: 21". Waist: 36". Color : Magenta & Black. Style : Ankle Pants. Length (inseam): 28". Length (outseam): 39". New COLDWATER CREEK COTTON Blue White Floral Capri Pants Size 8. Shipped with USPS Priority Mail. Material:62% Polyester, 33% Rayon, 5% Spandex. Inseam:29". Color: Khaki. Material: 98% Cotton, 2% Spandex. Type of Clothing: Pants. Length: 40”. Waist: 17”. Coldwater Creek. Woman's Natural Beige ~ Wide Leg ~ Willow Fit Dress Pants. 13.5" Across upper Thigh. 12" Leg Opening. The item is always better than the picture. Size 10 x 32. Zoom on pictures for better detail. XSSMLXL2XL00024681012141618202224 in.25 in.29 in.30 in.31 in.32 in.33 in.